Last week I wrote about the Notable Names Database, an interactive network diagram that allows you to explore the connection between all kind of famous people. Of course you can do the same with stories in the news. Slade Magazine did exactly that. 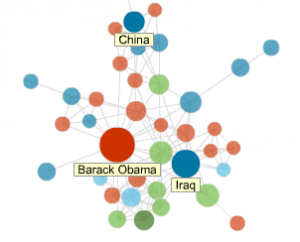 News Dots visualizes the connections between recent topics in the news as a giant social network. Subjects are represented by circles that are connected if they appear together in at least two stories. The size of the dot is proportional to the total number of times the subject is mentioned. Clicking a circle reveals the stories that mention them. Be sure to also check some other experiments in the Slade Labs of multimedia journalism (via).